A filling replaces part of a tooth that has been lost because of decay or through accidental damage. You may hear the dentist take about composite or glass ionomer – these are different types of white filling. Usually numb the area around the tooth with an injection – but some small fillings may not need this. 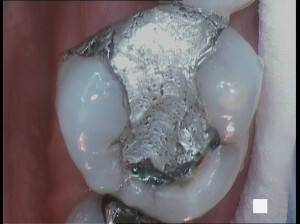 Remove any decay ,together with any old filling material, using a small, high speed drill. 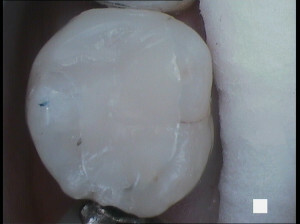 Remove any weak part of the tooth which may break later. Wash and dry the area. Coat the surface that is to be restored with a bonding agent and then place the filling material – this is pushed into the cavity that is to be filled and it is shaped as required. Harden the filling by pointing a bright light at it, inside your mouth – this is called curing. Unlike silver (amalgam) fillings, white filling material sticks to teeth can form edges, so it may be effectively used to repair teeth that are chipped, broken, decayed or worn. It can also be used as a veneer to cover marks or discolouration that cleaning wont remove. White fillings are less noticeable than silver fillings, which may turn black in the mouth. White fillings come in a range of shades so they can be matched to the colour of your own teeth.